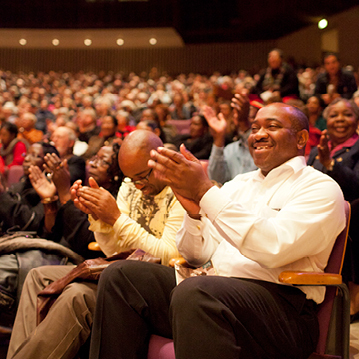 The Baltimore Choral Arts Society is a nonprofit arts organization, which relies on the encouragement and support of the community to sustain the high level of our performances, broadcasts, and educational programming. We invite you to become part of our vibrant organization by contributing to our growth and success. Ticket revenues only cover up to 30% of the costs of a concert. Gifts to our Annual Fund are essential to our performances. Additionally, a major portion of the operational costs of specific subscription concerts, school performances, and community outreach events are underwritten by sponsors, and we are delighted to recognize them accordingly. Click here for our current list of institutional donors. Click here for our current list of individual donors. When you shop at smile.amazon.com, Amazon donates to Baltimore Choral Arts Society. Click here for a list of Maryland employers that offer matching gift programs. Held every spring, our annual fundraiser, A Ruby Cabaret, is supported by many individuals and businesses in the Baltimore region through sponsorships, live and silent auction donations, and attendees.This event helps to support our robust education programs, including the Christmas for Kids concert. Save the date for our next event, held April 6, 2019 at the Grand Lodge in Hunt Valley! Click here for this year's Ruby Cabaret donors. Click here for this year's Christmas for Kids donors. The up and down cycles of the economy would have a much greater effect on our programs without the safety net of our endowment fund revenues. They help to keep the quality and quantity consistently excellent. In 2017, the Board established a special endowment fund in honor of Tom Hall upon his retirement after 35 years as Music Director. Gifts made to this fund are part of Baltimore Choral Arts’ endowment. Click here for our current list of endowment donors. The Fund for Artistic Excellence is used to engage special guest artists and enhance Choral Arts concerts. The Fund for Young Singers supports early-career vocal artists employed by Choral Arts. Click here for our current list of Artistic Excellence & Young Singers donors. Our Legacy Circle is becoming the core of our future. Planned gifts can be advantageous to both donor and beneficiary: they may save taxes and allow a higher income to the donor or larger gifts to heirs. Please consider a planned gift to BCAS in your financial and retirement planning. Please contact Executive Director Jack Fishman at 410-523-7070 ext 302 for information on any of these opportunities.